In biology, the canopy is the aboveground portion of a plant community or crop, formed by the collection of individual plant crowns. In forest ecology, canopy also refers to the upper layer or habitat zone, formed by mature tree crowns and including other biological organisms (epiphytes, lianas, arboreal animals, etc.). Sometimes the term canopy is used to refer to the extent of the outer layer of leaves of an individual tree or group of trees. Shade trees normally have a dense canopy that blocks light from lower growing plants. Canopy structure is the organization or spatial arrangement (three-dimensional geometry) of a plant canopy. Leaf Area Index (LAI), leaf area per unit ground area, is a key measure used to understand and compare plant canopies. It is also taller than the understory layer. Dominant and co-dominant canopy trees form the uneven canopy layer. Canopy trees are able to photosynthesize relatively rapidly due to abundant light, so it supports the majority of primary productivity in forests. 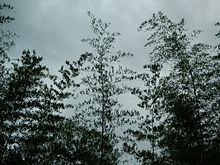 The canopy layer provides protection from strong winds and storms, while also intercepting sunlight and precipitation, leading to a relatively sparsely vegetated understory layer. Forest canopies are home to unique flora and fauna not found in other layers of forests. The highest terrestrial biodiversity resides in the canopy of tropical rainforests. Many rainforest animals have evolved to live solely in the canopy, and never touch the ground. The canopy of a rainforest is typically about 10m thick, and intercepts around 95% of sunlight. The canopy is below the emergent layer, a sparse layer of very tall trees, typically one or two per hectare. With an abundance of water and a near ideal temperature in rainforests, light and nutrients are two factors that limit tree growth from the understory to the canopy. In the permaculture and forest gardening community, the canopy is the highest of seven layers. ^ Campbell, G.S., and J.M. Norman. 1990. The description and measurement of plant canopy structure. pp. 1-19 In: Russell, G., B. Marshall, and P.G. Jarvis (editors). Plant Canopies: Their Growth, Form and Function. Cambridge University Press. ^ Moffett, M.W. 2000. What's up? A critical look at the basic terms of canopy biology. Biotropica 32:569-596. ^ Parker, G.G. 1995. Structure and microclimate of forest canopies. pp. 73-106 In: Lowman, M.D. and N.M. Nadkarni (editors). Forest Canopies. Academic Press, San Diego, CA. ^ Lowman, M.D. and M.W. Moffett. 1993. The ecology of tropical rain forest canopies. Trees 8:104-107. ^ "Light in the Rain Forest". garden.org. Retrieved 23 November 2015. Moffett, M.W. 1994. The High Frontier: Exploring the Tropical Rainforest Canopy. Harvard University Press, Cambridge, MA. Wikimedia Commons has media related to Tree canopies.